We present a novel combined behavioral and neuroimaging protocol employing real-time video projection for the purpose of characterizing the neural correlates associated with mirror therapy within the magnetic resonance imaging scanner environment in leg amputee subjects with phantom limb pain. Saleh Velez, F. G., Pinto, C. B., Bailin, E. S., Münger, M., Ellison, A., Costa, B. T., Crandell, D., Bolognini, N., Merabet, L. B., Fregni, F. Real-time Video Projection in an MRI for Characterization of Neural Correlates Associated with Mirror Therapy for Phantom Limb Pain. J. Vis. Exp. (146), e58800, doi:10.3791/58800 (2019). Mirror therapy (MT) has been proposed as an effective rehabilitative strategy to alleviate pain symptoms in amputees with phantom limb pain (PLP). However, establishing the neural correlates associated with MT therapy have been challenging given that it is difficult to administer the therapy effectively within a magnetic resonance imaging (MRI) scanner environment. To characterize the functional organization of cortical regions associated with this rehabilitative strategy, we have developed a combined behavioral and functional neuroimaging protocol that can be applied in participants with a leg amputation. This novel approach allows participants to undergo MT within the MRI scanner environment by viewing real-time video images captured by a camera. The images are viewed by the participant through a system of mirrors and a monitor that the participant views while lying on the scanner bed. In this manner, functional changes in cortical areas of interest (e.g., sensorimotor cortex) can be characterized in response to the direct application of MT. PLP refers to the sensation of pain perceived within the area corresponding to the missing limb postamputation1,2. This condition is a significant chronic health care burden and can have a dramatic impact on an individual's quality of life3,4. It has been suggested that alterations in the brain structure and function play a fundamental role in the development and neuropathophysiology of PLP5,6. However, the underlying neural correlates of how pain symptoms develop and how they can be alleviated in response to treatment remain unknown. This lack of information is mostly due to technical challenges and limitations associated with performing a given therapeutic approach within the constraints of a neuroimaging environment such as MRI5,7,8. Results from a number of studies attribute the development of PLP to maladaptive neuroplastic reorganization occurring within sensorimotor cortices, as well as in other areas of the brain. For example, it has been shown that following the amputation of a limb, there is a shift in the corresponding sensorimotor cortical representation of neighboring areas. As a result, neighboring areas apparently start invading the zones that used to correspond to the amputated limb9,10. In order to alleviate pain symptoms associated with PLP, treatments such as MT or motor imagery may be effective9,11,12. It is suggested that the alleviation of symptoms occurs putatively through the cross-modal re-establishment of afferent inputs, provided by the observation of mirror-reflected images from the nonaffected limb12,13,14,15,16,17. Through these images, participants are able to visualize the reflection of the opposite limb instead of the one that has been amputated, thus creating an illusion that both limbs remain. The illusion and immersive effects were previously studied by Diers et al. in healthy subjects in which a comparison of functional activation through functional MRI (fMRI) was evaluated after undergoing a task either with a common mirror box or virtual reality18. However, the neural correlates associated with the reversal of the maladaptive neuroplastic changes and the alleviation of symptoms remain poorly understood. Additionally, the underlying mechanism of PLP remains a topic of research as the clear underlying physiopathologic alteration behind the development of PLP is still incompletely elucidated while controversial findings have been revealed5,19. As stated above, multiple authors attribute the development of pain to deafferentation and cortical reorganization of the affected brain area (area of the amputated limb)6,7,8; however, opposite results were described by Makin and collaborators in which the presence of pain is associated with the preservation of brain structure and pain is attributed to a reduction interregional functional connectivity19. In view of these controversial and opposite findings, we believe that the novel approach presented here will bring additional relevant information to the study of PLP and will allow scientists to evaluate the effects of MT in a live environment with the degree of brain activation while comparing them with the levels of pain assessed in our full protocol19. Previous literature on this topic has shown that MT is one of the most appropriate behavioral therapies for the treatment of PLP due to its easy implementation and low costs12. In fact, previous studies of this technique have shown evidence of a reversal of maladaptive changes within the primary sensorimotor cortex in amputees with PLP8,20,21. Even though MT is perhaps one the most inexpensive and most effective approach to treat PLP12,22,23,24, more studies are needed to confirm these effects since some patients do not respond to this type of treatment8 and there is a lack of larger randomized clinical trials that provide high-evidence-based results25. One of the hypotheses by which MT can reduce PLP is related to the fact that the mirror image of the not-amputated body part helps to reorganize and integrate the mismatch between proprioception and visual feedback26. The underlying mechanisms of MT could be associated with the reversion of the maladaptive mapping of somatosensory8,27,28. For MT, subjects are required to perform several motor and sensory tasks using their intact limb (e.g., flexion and extension) while observing this effect in a mirror located in the midline of the participant's body, thereby creating a vivid and precise representation of movement within the area of the amputated limb29. To further develop the scientific understanding of the pathophysiology aspects involved in PLP, it is crucial to better characterize the underlying neuroplastic changes that result from limb amputations, as well as the improvement of pain symptoms provided by MT. In this regard, neuroimaging techniques, such as fMRI, have emerged as powerful tools to help elucidate the pathophysiologic mechanisms associated with cortical reorganization and provide clues toward optimizing the rehabilitation of individuals with PLP in the clinical context30,31. Furthermore, the high spatial resolution afforded by fMRI (as compared to electroencephalography, for example) allows for more accurate mapping of brain responses, such as finger and digit representations, in the sensorimotor cortex along with other regions of the brain32. To date, the neurophysiology associated with MT remains elusive due in large part to the challenges of carrying out the procedure within the scanner environment (i.e., it is difficult for an individual to perform the therapy while lying in the scanner). Here, we describe a method that allows for an individual to observe their own leg movement in real-time while lying supine within the narrow confines of the scanner bore. An accurate recreation of the vivid and immersive sensation elicited by the therapy can be recreated using a video camera that captures real-time images of the moving leg, and a system of mirrors and a monitor that can be viewed directly by the study participant. Past studies have attempted to incorporate techniques such as video recording, virtual reality, and prerecorded animations as means to present the visual stimulus and circumvent these technical challenges9,16,33,34. Yet, these techniques have been limited in their effectiveness35,36,37,38,39. In the particular case of using a prerecorded video, there is an often poor synchronization between participants' movements and the ones provided by the video, as well as a lack of timing accuracy, which leads to a poor realistic impression that the individual's own leg is moving. In order to improve this sense of sensorimotor immersion, other techniques, such as virtual reality and digitized animations, have been attempted. Yet, they have failed to generate visually convincing sensations due to a low image resolution, a limited field of view, unrealistic or nonnatural human-like motions, and presence of motion lag (i.e., desynchronization of movement). Additionally, the lack of an accurate modeling combined with the poor control over other features, such as the effects of friction, momentum, and gravity, hinders the perception of a vivid and immersive feel40. Therefore, for amputees, it is worth to explore strategies to ensure that subjects are engaged in the cognitive task (observation) and immersive on the illusion of amputated limb movement. Finally, the required resources for developing and implementing these complex strategies may be time-consuming and/or cost prohibitive. We describe a new approach that we believe creates a realistic and vivid sense of immersion whereby the participant can see a live and real-time video of a projected image of their own limb while they perform a session of the MT31. This approach is performed while the individual is lying in the scanner bore and is without substantial costs or extensive technical development. This protocol is part of a National Institutes of Health (NIH) Research Project Grant (RO1)-sponsored clinical trial that evaluates the effects of the combination of a neuromodulatory technique, namely transcranial direct current stimulation (tDCS), with a behavioral therapy (mirror therapy) in order to relieve phantom limb pain31. We evaluate changes in the visual analog scale (VAS) for pain at baseline, prior, and after each intervention session. fMRI is used as a neurophysiologic tool in order to evaluate structural changes in brain function and its correlation with the relief of PLP. Therefore, an initial fMRI is obtained in order to have a baseline map of the structural organization of the participant's brain, which will either show that there is cortical maladaptive reorganization5,6,8,11,13,14,18,28 or that there is not19; in the same way, the scientist can observe what areas are activated at baseline with the task of MT in order to understand the areas' activation response to the MT; lastly, it is possible to obtain a second fMRI postintervention to see if changes (modulation) have been generated in the cortical reorganization after the combined therapy with tDCS and MT and to analyze if those changes are correlated or associated with the degree of pain change. Therefore, this protocol allows scientists to evaluate structural reorganization changes in patients with PLPs during MT and also helps them to understand if these changes seen in fMRI are associated with changes in PLP, therefore providing additional details on how MT affects brain structural and functional activity to modify phantom pain. Prior to participation, have the participant complete a consent form and an MRI safety screening evaluation, the latter carried out by the neuroimaging technician at the scanning facility, to ensure that the participant does not have any known contraindications to being scanned (e.g., metal in their body, a history of claustrophobia, or pregnancy). Provide the participant with detailed instructions with regard to the experimental procedure. Have the subject listen to an instructional recorded audio to ensure that they are able to understand and follow the instructions provided during the scanning procedure. Carry out a practice run in a mock scanner to facilitate the familiarization of the task instructions within the scanner environment. NOTE: The mock scanner is similar in every way to the real data-acquiring MRI scanner, but without the active magnet. Give clear instructions to the participant to avoid any movements of the residual and phantom limb to avoid any contractions of the stump muscles that can interfere with the brain signal. NOTE: The experimental protocol is similar to what has been previously described for the purposes of investigating the neural correlates associated with the mental imagery of moving the upper limbs. Here, we have adapted the approach to the movement of lower limbs. Specifically, the behavioral tasks consist of the following. Before entering the scanner room, ask the participant to remove their prosthesis and any metal objects. Have the MRI technician make sure that the participant has no metal on their body that might put them at risk. Transport the participant to the MRI room in an MRI-compatible wheelchair; after that, ask the participant to transfer themselves to the MRI scanner bed. 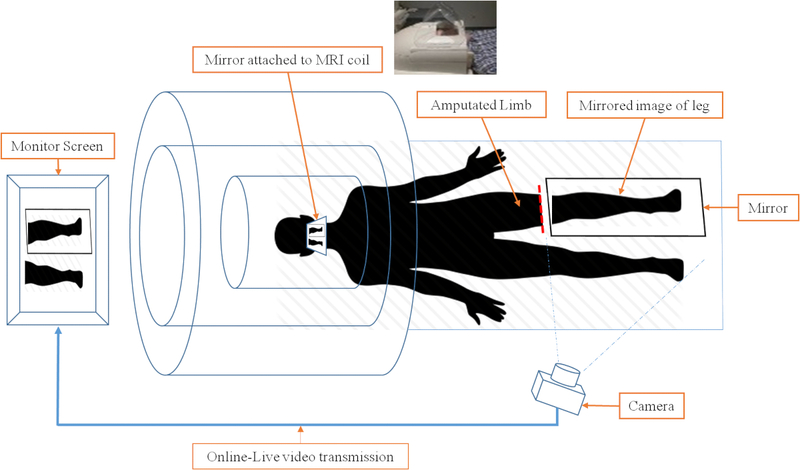 For the MT, comfortably place a single-piece, MRI-compatible, horizontal mirror (10,000 mm x 255 mm x 3 mm) supported by a triangular stand between the legs of the participant while they are lying supine on the scanner bed. Use sandbags in order to allow stability and a better positioning of the mirror. Attach the mirror stand to an adjustable arm so that it can be positioned in accordance with the subject's height and positioning without contacting any part of the body ( Figure 1). Figure 1: Video camera and mirror set up. The mirror is positioned between the legs at an angle of about 45°, depending on the participant's height and amputation level. The goal is to cover the residual limb and make it invisible to the video systems. Sandbags are used to keep the mirror in the correct position. The camera positioning is also adaptable and can be easily changed using the tripod or the adaptable hock (changes the angle of the camera). Please click here to view a larger version of this figure. For the visual feedback, mount an MRI-compatible digital camera on an adjustable tripod stand near the intact leg of the participant ( Figure 1). NOTE: The camera used is listed in the Table of Materials and costs approximately 217 USD. The camera acquires images in 1,080 pixels image resolution. Since the camera itself was not placed inside of the MRI bore, there is not a need for costlier MRI-compatible systems. The camera is attached to an MRI-safe IV pole via a gooseneck modular hose to enable positioning changes. Attach the camera to a tripod, allowing the appropriate adjustment of the viewing angle and field of view. Place a second mirror on the MRI head coil, allowing the participant to view the image presented on the monitor directly while lying completely inside the scanner bore ( Figure 2). Figure 2: Schematic of video camera and image projection in the scanner environment. The real-time video projection of the mirror therapy system consists of three subsystems. 1) Camera and monitor subsystem. The video is transmitted to the monitor, so the subject can watch the leg and mirror leg movements in real-time. 2) The head coil with the mirror attached. The mirror in the head coil allows the participant to watch the monitor without moving their head. The mirror is at a 45° angle at eye level. 3) The mirror and sandbags. The MRI-compatible mirror is carefully placed between the legs and the residual limb in a way that it covers the residual limb and allows for the best image to be shown. Please click here to view a larger version of this figure. Set up the real-time video image transmission to be sent through a computer-controlled system and project it onto a monitor placed at the back of the scanner bore (near the head of the participant). NOTE: There is no perceivable time delay between the projection and the captured actual movement. The actual movement and the visual feedback are separated by less than a second which does not interfere in the real-time feeling, as stated by participants. Acquire fMRI data with a 3 T scanner using an 8-channel phased-array head coil. Obtain imaging sequences that include a high-resolution T1-weighted structural image (TE: 3.1 ms, TR: 6.8 ms, flip angle: 9°, isotropic 1 mm voxel size) (anatomical scan), and blood-oxygen-level-dependent (BOLD) fMRI signal measurements using a protocol based on multislice gradient (fast-field) echo-planar imaging (EPI) and standard parameters (TE: 28 ms, TR: 2 s, flip angle: 90°, isotropic 3 mm voxel size, oriented axially and covering the whole brain). NOTE: The entire scanning procedure lasts approximately 30 min. This includes an initial 4 min structural (anatomical) scan and four task (functional) acquisitions lasting 6 min each. For each task (functional acquisition), the patient is expected to tap their foot at a speed of 1 tap every second. During the scans, have the participant wear sound-isolating MRI compliant headphones (e.g., Westone) throughout the scanning session to hear the investigator's auditory commands. While the patient is lying in the scanner, play the auditory track so that the participant hears a series of auditory cues for performing the given behavioral task. Use the following commands: 1) "leg" for movement of the amputated leg (see the note after step 3.11); 2) "mirror" for movement of the intact leg while viewing a real-time video recording (thus observing the movement of a leg in the position of the amputated leg using the mirror); 3) "rest" in which the participant stops any leg movement and lies motionless with their eyes closed. In addition, have the investigator says "start" and "end" to signify the beginning and the end of the experimental run, respectively ( Figure 3). Figure 3: Task design. The task design consists of three steps. During the first "leg" step, the subject is instructed to move the leg (flexing the foot) at a pace of about one movement every 2 s (10 movements in 20 s), with their eyes closed. 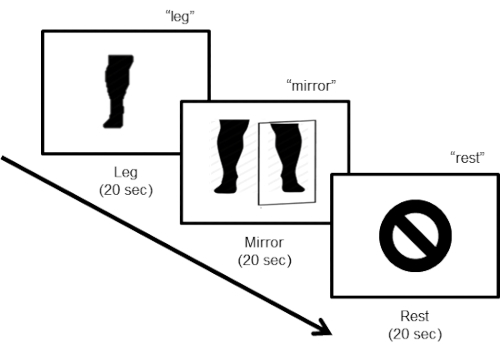 For the second "mirror" step, the participant has to keep moving the leg (10 movements in 20 s) while looking at the video monitor displaying the online real-time mirror image of the legs. The last step instructs the subject to rest. Have the participant perform a movement with the nonamputated lower leg with the eyes closed (i.e., repeated plantar flexion and dorsal flexion of the foot at a pace of approximately one tap per 2-3 s). Have the participant perform the same leg movement, but now the participant observes a mirror image of his/her leg moving in the place of the amputated leg using real-time video capture of the movement of the intact leg. Have the participant perform a rest condition, in which he/she lays still with no movement of the legs. NOTE: Each condition lasts for 20 s (i.e., one experimental block = 60 s) for a run length time of 6 min (six repetitions of the experimental run per block). Collect data in a single session for each participant. Instruct the investigator to take note of any unwanted movements, and, in between the runs, to instruct the participant to keep the correct pace and movements. Make sure that, after the procedures are performed, the investigator transfers the data to an encrypted flash drive and stores it in a secure location in the facility. NOTE: In this protocol, the word "leg" is used in place of the word "foot". Even though the participants are only making foot movements (due to restraints from the MRI machine), most of them have a bigger part of the lower limb amputated and are referred as leg amputees, not foot. Analyze the functional neuroimaging data using standard techniques30,41, using the longitudinal analysis design (baseline and posttreatment) and processing stream in the FMRIB Software Library (FSL) software package42,43. For each functional scan, perform 3D motion correction using the first volume alignment, high-pass filtering to remove temporal linear trends, and perform a correction for slice time acquisition and spatial smoothing (Gaussian kernel, 5.0 mm full width at half maximum [FWHM]). Mark volumes with a motion above 0.9 mm in any direction with FSL's motion outlier detection processing stream and mathematically "scrub" them from the final analysis44. NOTE: If more than 25% of the volumes are designated for removal, the whole acquisition should be excluded from the total dataset. Coregister each of the preprocessed functional images to the high-resolution anatomical and, then, bring them into standard Talairach space. Fit a general linear model (GLM) to a voxel time course where each experimental condition is modeled by a boxcar regressor that should be smoothed with double-gamma hemodynamic response function. Use the high-resolution anatomical T1-weighted anatomical volume to construct an inflated cortical surface mesh to see the sulcal activation, and then, project individual subject maps for each contrast of interest onto the subject's reconstructed mesh. NOTE: The projections should show the significant values from the GLM. Set the statistical significance value threshold at the standard criterion of p < 0.001 corrected for multiple comparisons, using a cluster-size threshold adjustment. Conduct a region of interest (ROI) analysis. Define the primary ROI broadly with FreeSurfer's Desikan atlas45 of the primary sensorimotor cortex and, then, refine it for each subject by using the subject-specific functional activation during the leg vs. rest condition at the baseline scan. Reflect the refined primary ROI onto the homologous area of the opposite hemisphere (i.e., ipsilateral primary sensorimotor representation of the intact lower limb). Use the standard FreeSurfer anatomical Desikan atlas45 to define the entire (bilateral) occipital visual cortex for the secondary ROI. Generating the sensation associated with MT using real-time video projection is feasible. Participants have subjectively reported that the video image perceived is life-like and the sensation is immersive. 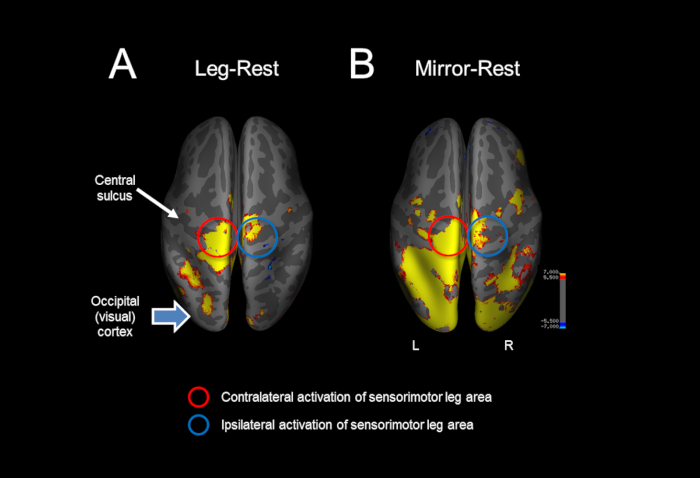 Furthermore, the patterns of cortical activation associated with MT (i.e., movement of the leg and viewing the projected mirror image) in the scanner environment are robust. In a pilot study, the cortical responses to MT were recorded using fMRI in a participant with lower-limb amputation of the left leg (male, 56 years old, traumatic amputation of lower leg below the knee) following the task protocol described above. Comparing leg movement versus the rest condition resulted in a robust activation within the sensorimotor representation of the leg of the contralateral (i.e., left) hemisphere. Ipsilateral cortical activation was observed within the sensorimotor leg area (Figure 4A). The mirror condition versus rest condition also confirmed robust contralateral as well as ipsilateral activation of the cortical leg sensorimotor representation. Additionally, robust cortical activation was seen with posterior occipital (i.e., visual) cortical areas associated with viewing the projected image of the moving leg. The patterns of activation described represent activations at the baseline condition, that is, at the initiation of the therapy period. The initial responses serve to define the baseline activation for the purposes of defining regions of interest (ROIs), and a subsequent comparison after the MT protocol is completed in each individual. Figure 4: Representative example of the cortical activations in response to mirror therapy in the MRI scanner. (A) Comparing leg movement versus the rest condition resulted in a robust activation within the sensorimotor representation of the leg of the contralateral (i.e., left) and ipsilateral cortex. (B) The mirror condition versus rest condition also confirmed a robust contralateral and ipsilateral activation of the cortical leg sensorimotor representation, as well as occipital (i.e., visual) cortical activation associated with viewing the projected image of the moving leg. Please click here to view a larger version of this figure. This protocol describes a novel, feasible procedure that allows investigators to accurately characterize the neural correlates associated with MT in individuals with PLP. As previously mentioned, past studies have attempted to investigate the neural correlates associated with MT treatment by incorporating various techniques such as video recording, virtual reality, and prerecorded animations9,33,34. However, these approaches have been limited in terms of effectiveness37,38,39. In the protocol outlined here, we incorporate simple, commercially available, and low-cost elements to create a life-like and immersive sensation associated with MT within the MRI environment. All the equipment used is MRI compatible (i.e., nonferromagnetic materials) and can be easily adjusted and modified for each individual. The key elements consist of three main subparts: (1) video camera and monitor; (2) the reflective mirror attached to the head coil; (3) the large reflective mirror and supports. The video is transmitted to the monitor so the subject can watch the leg and mirror leg movements in real-time. The orientation of the mirror in the head coil allows the participant to view the monitor while lying supine and without excessive movement of the head. The mirror is adjusted to the subject's amputated leg length using an adjustable stand in order to avoid any contact with the participant's leg. From a data acquisition and analysis point of view, functional neuroimaging data is analyzed using standard techniques (i.e., region of interest analysis) with special emphasis on a pre-post longitudinal design30,41. Besides the real-life immersive sensation provided to the participant, another advantage of this protocol is that the system can be adjusted for the purposes of viewing different limbs (upper and lower) and can be used to test any combination of limb movement. The immersive sensation provided by the video transmission is an important factor when it comes to generating the potential therapeutic effect of MT. The use of the real-time video captured from the video camera as presented here can be superior to past approaches such as computerized images, virtual reality, or prerecorded images. However, we did not compare this technique with visual illusion ones. Moreover, a previous study in healthy participants evaluated functional brain activation after performing a task with a conventional mirror box and a virtual-reality-projected image of the upper limb. In the results of this study, Diers and collaborators found no differences between vividness or perceived authenticity of the illusion between the visual reality illusion and the mirror box therapy18. On the other hand, this protocol also has its limitations and challenges associated with it: due to the nature of the leg movement, motion artifacts (i.e., associated with excessive head movement) may compromise data quality. Although the patient is allowed to see a projected live image of their own limb, the protocol lacks a questionnaire to properly assess the vividness and immersion that the participant feels while undergoing the tasks. In addition, we did not compare the task performed in this technique with other strategies, such as visual stimuli only of a recording of the leg movement without the patient actually performing the movement or a virtual reality imaging projection of a lower limb moving. This was done in particular because it was not the goal of this protocol and because there are previous studies that have already studied and compared these interventions and revealed no difference in the pattern of activation, as well as no difference in vividness of the task between interventions, as mentioned above18. In addition, to overcome challenges related to the motion, we employed current state-of-the-art motion detection and correction strategies26. To further improve data quality, new strategies (e.g., physical restraints placed around the subject's hips to help isolate leg motion) are being pursued. Lastly, with regard to modification and troubleshooting, we initially had a fixed camera stand that did not allow us to obtain and adequately capture the patient's lower limb reflection in the mirror; however, utilizing an adjustable stand, we were able to obtain the most precise and accurate image transmission. Additionally, during the first steps of the development of the protocol, the mirror stand was fragile and fell easily with any mild movement. This was overcome when sandbags were added to give stability to the mirror montage. Finally, given the ease of implementing the experimental setup, this approach may allow the evaluation of the effects of MT not only in limb amputees but also in other conditions which use this treatment approach, such as stroke and spinal cord injury. This study was supported by an NIH RO1 grant (1R01HD082302). Louis, E. D., York, G. K. Weir Mitchell’s observations on sensory localization and their influence on Jacksonian neurology. Neurology. 66, (8), 1241-1244 (2006). Weinstein, S. M. Phantom Limb Pain and Related Disorders. Neurologic Clinics. 16, (4), 919-935 (1998). Rudy, T. E., Lieber, S. J., Boston, J. R., Gourley, L. M., Baysal, E. Psychosocial Predictors of Physical Performance in Disabled Individuals With Chronic Pain. The Clinical Journal of Pain. 19, (1), 18-30 (2003). Whyte, A. S., Carroll, L. J. A preliminary examination of the relationship between employment, pain and disability in an amputee population. Disability and Rehabilitation. 24, (9), 462-470 (2002). Flor, H., Diers, M., Andoh, J. The neural basis of phantom limb pain. Trends in Cognitive Sciences. 17, (7), 307-308 (2013). Flor, H., Nikolajsen, L., Staehelin Jensen, T. Phantom limb pain: a case of maladaptive CNS plasticity? Nature Reviews. Neuroscience. 7, (11), 873-881 (2006). Lotze, M., Flor, H., Grodd, W., Larbig, W., Birbaumer, N. Phantom movements and pain. An fMRI study in upper limb amputees. Brain: A Journal of Neurology. 124, (Pt 11), 2268-2277 (2001). Foell, J., Bekrater-Bodmann, R., Diers, M., Flor, H. Mirror therapy for phantom limb pain: Brain changes and the role of body representation. European Journal of Pain (United Kingdom). 18, (5), 729-739 (2014). Subedi, B., Grossberg, G. T. Phantom limb pain: Mechanisms and treatment approaches. Pain Research and Treatment. 2011, (2011). Elbert, T., et al. Extensive reorganization of the somatosensory cortex in adult humans after nervous system injury. NeuroReport. 5, (18), 2593-2597 (1994). Diers, M., Christmann, C., Koeppe, C., Ruf, M., Flor, H. Mirrored, imagined and executed movements differentially activate sensorimotor cortex in amputees with and without phantom limb. Pain. 149, (2), 296-304 (2010). Chan, B. L., et al. Mirror therapy for phantom limb pain. The New England Journal of Medicine. 357, (21), 2206-2207 (2007). Flor, H., Knost, B., Birbaumer, N. Processing of pain- and body-related verbal material in chronic pain patients: central and peripheral correlates. Pain. 73, (3), 413-421 (1997). Flor, H., Braun, C., Elbert, T., Birbaumer, N. Extensive reorganization of primary somatosensory cortex in chronic back pain patients. Neuroscience Letters. 224, (1), 5-8 (1997). Bolognini, N., Russo, C., Vallar, G. Crossmodal illusions in neurorehabilitation. Frontiers in Behavioral Neuroscience. 9, (August), (2015). Senna, I., Russo, C., Parise, C. V., Ferrario, I., Bolognini, N. Altered visual feedback modulates cortical excitability in a mirror-box-like paradigm. Experimental Brain Research. 233, (6), 1921-1929 (2015). Ambron, E., Miller, A., Kuchenbecker, K. J., Buxbaum, L. J., Coslett, H. B. Immersive low-cost virtual reality treatment for phantom limb pain: Evidence from two cases. Frontiers in Neurology. (2018). Diers, M., et al. Illusion-related brain activations: A new virtual reality mirror box system for use during functional magnetic resonance imaging. Brain Research. 1594, 173-182 (2015). Makin, T. R., et al. Phantom pain is associated with preserved structure and function in the former hand area. Nature Communications. 4, 1570 (2013). Darnall, B. D., Li, H. Home-based self-delivered mirror therapy for phantom pain: A pilot study. Journal of Rehabilitation Medicine. 44, (3), 254-260 (2012). Rothgangel, A. S., Braun, S. M., Beurskens, A. J., Seitz, R. J., Wade, D. T. The clinical aspects of mirror therapy in rehabilitation: a systematic review of the literature. International Journal of Rehabilitation Research. 34, (1), 1-13 (2011). Griffin, S. C., et al. Trajectory of phantom limb pain relief using mirror therapy: Retrospective analysis of two studies. Scandinavian Journal of Pain. 15, 98 (2017). Tsao, J. W., Finn, S. B., Miller, M. E. Reversal of phantom pain and hand-to-face remapping after brachial plexus avulsion. Annals of Clinical and Translational Neurology. 3, (6), 463-464 (2016). Tung, M. L., et al. Observation of limb movements reduces phantom limb pain in bilateral amputees. Annals of Clinical and Translational Neurology. 1, (9), 633-638 (2014). Datta, R., Dhar, M. Mirror therapy: An adjunct to conventional pharmacotherapy in phantom limb pain. Journal of Anaesthesiology, Clinical Pharmacology. 31, (4), 575-578 (2015). Kim, S. Y., Kim, Y. Y. Mirror therapy for phantom limb pain. The Korean Journal of Pain. 25, (4), 272-274 (2012). Halligan, P. W., Zeman, A., Berger, A. Phantoms in the brain. Question the assumption that the adult brain is “hard wired“. BMJ (Clinical Research ed.). 319, (7210), 587-588 (1999). Flor, H., et al. Phantom-limb pain as a perceptual correlate of cortical reorganization following arm amputation. Nature. 375, (6531), 482-484 (1995). Genius, J., et al. Mirror Therapy:Practical Protocol for Stroke Rehabilitation. Pain Practice. 16, (4), 422-434 (2013). Forman, S. D., et al. Improved assessment of significant activation in functional magnetic resonance imaging (fMRI): use of a cluster-size threshold. Magnetic Resonance in Medicine. 33, (5), 636-647 (1995). Pinto, C. B., et al. Optimizing Rehabilitation for Phantom Limb Pain Using Mirror Therapy and Transcranial Direct Current Stimulation: A Randomized, Double-Blind Clinical Trial Study Protocol. JMIR Research Protocols. 5, (3), e138 (2016). Goense, J., Bohraus, Y., Logothetis, N. K. fMRI at High Spatial Resolution: Implications for BOLD-Models. Frontiers in Computational Neuroscience. 10, 66 (2016). Khor, W. S., et al. Augmented and virtual reality in surgery—the digital surgical environment: applications, limitations and legal pitfalls. Annals of Translational Medicine. 4, (23), 454 (2016). Nosek, M. A., Robinson-Whelen, S., Hughes, R. B., Nosek, T. M. An Internet-based virtual reality intervention for enhancing self-esteem in women with disabilities: Results of a feasibility study. Rehabilitation Psychology. 61, (4), 358-370 (2016). Henry, J. Virtual Reality in 2016: Its Power and Limitations. Medium. (2016). Renner, R. S., Velichkovsky, B. M., Helmert, J. R. The perception of egocentric distances in virtual environments - A review. ACM Computing Surveys. 46, (2), 1-40 (2013). Huang, M. P., Alessi, N. E. Current limitations into the application of virtual reality to mental health research. Studies in Health Technology and Informatics. (1998). Ballester, B. R., et al. Domiciliary VR-Based Therapy for Functional Recovery and Cortical Reorganization: Randomized Controlled Trial in Participants at the Chronic Stage Post Stroke. JMIR Serious Games. 5, (3), e15-e15 (2017). Bower, K. J., et al. Clinical feasibility of interactive motion-controlled games for stroke rehabilitation. Journal of Neuroengineering and Rehabilitation. 12, 63 (2015). Reed, S. K. Structural descriptions and the limitations of visual images. Memory & Cognition. 2, (2), 329-336 (1974). Boynton, G. M., Engel, S. A., Glover, G. H., Heeger, D. J. Linear Systems Analysis of Functional Magnetic Resonance Imaging in Human V1. The Journal of Neuroscience. 16, (13), 4207-4221 (1996). Jenkinson, M., Beckmann, C. F., Behrens, T. E. J., Woolrich, M. W., Smith, S. M. FSL. NeuroImage. 62, (2), 782-790 (2012). Smith, S. M., et al. Advances in functional and structural MR image analysis and implementation as FSL. NeuroImage. 23, (Supple), S208-S219 (2004). Siegel, J. S., et al. Statistical Improvements in Functional Magnetic Resonance Imaging Analyses Produced by Censoring High-Motion Data Points. Human Brain Mapping. 35, (5), 1981-1996 (2014). Desikan, R. S., et al. An automated labeling system for subdividing the human cerebral cortex on MRI scans into gyral based regions of interest. NeuroImage. 31, (3), 968-980 (2006).